From a single touch I can create beautiful pieces of jewellery, customised with your childs unique fingerprint that you can keep with you always. Our children grow up so quickly, Will you remember just how tiny & perfect their little fingers are? What if you could hold on to those precious memories forever, keeping their touch with you always. This is what I can do for you. 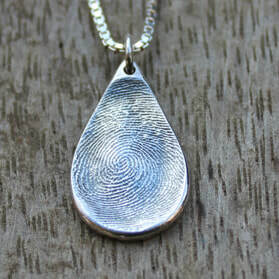 Click here for more information on fingerprint jewellery.